MiFID II is designed to improve the integrity and fairness of financial markets with a particular emphasis on ensuring that clients adhere to best execution policies and that dark liquidity pools become more transparent. This new paradigm has led to a market structure with significant fragmentation across Europe. Vela helps clients address these challenges by providing low latency normalized access to venues through a unified set of APIs. As new venues and market segments are launched Vela’s market coverage will continue to expand. This includes an increased focus on Fixed Income and Systematic Internalisers introduced as a consequence of MiFID II. To help clients realize their best execution policies, Vela's Ticker Plant consolidates multiple markets and liquidity venues into a single composite order book, providing a unified holistic view of an instrument's liquidity across venues through the same normalized API. Similarly, as we see regulated markets attempt to retain order flow by launching new competing services, for example trade reporting (APA), block trading (LIS) and dynamic auctions (Periodic Auctions, Auction on Demand), we have added support for these new services across our products including incorporating them into our market data model to correctly identify and classify these new modes of trading. MiFID II RTS6 puts particular focus on algorithmic trading and technical standards. 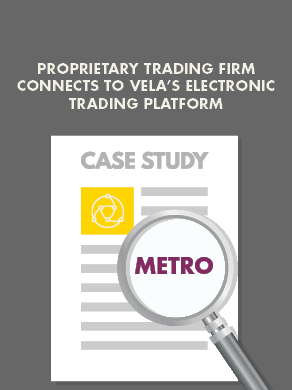 Vela's enhanced pre- and post-trade risk systems, including a rich set of risk filters and kill switch functionality, help ensure orders adhere to risk constraints that must be agreed between clients and brokers. All transactions via Vela software are stored in audit logs for full traceability with all exchange-mandated fields to help clients prove systems are resilient and cannot contribute to disorderly market behavior. Our software supports minimum tick-size tables, nanosecond hardware time-stamping and all Vela data centers are live with PTP which has GPS UTC as source time to facilitate clock synchronization and accuracy requirements.